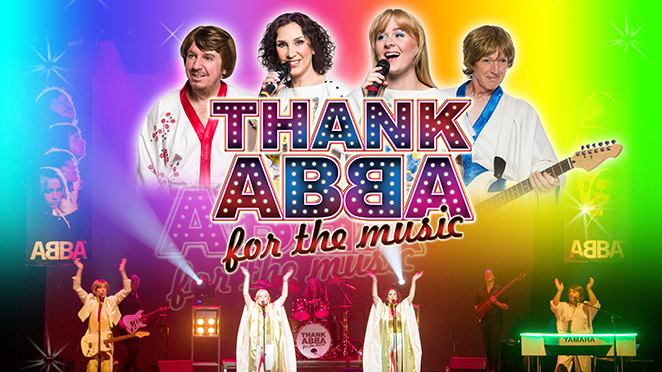 THANK ABBA FOR THE MUSIC is a theatre spectacular that captures all of the magic and excitement of one of pop history's most successful and iconic bands. With stunning costumes, a 7-piece live band, interactive video projection and of course ABBA's spectacular trademark harmonies, this is the ultimate feel-good party show! Featuring all of ABBA's greatest hits including Dancing Queen, Waterloo, Mamma Mia, Gimme! Gimme! Gimme!, Fernando, Super Trouper and many many more!